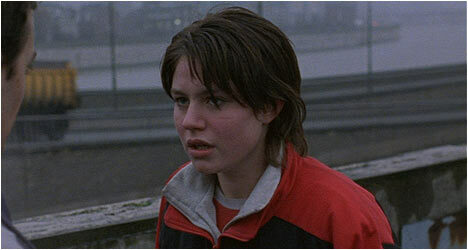 Rosetta (1999) marked Jean-Pierre and Luc Dardenne’s second film and one in which launched them internationally, winning the prestigious Palme d’Or at the Cannes Film Festival. Their film took a raw, unfiltered look at a young woman struggling to survive in a refreshingly honest and unromantic way. The film starts with a burst of energy as Rosetta (Dequenne) walks angrily through a factory and confronts her boss over being fired. After getting in a scuffle with him, she leads the company security on a chase through the building before being caught and kicked out. This is all captured via long takes and jittery hand-held camerawork, giving it a sense of immediacy and intimacy. The opening scene does an excellent job establishing the film’s style. The camera almost always stays close to Rosetta and follows her through a turbulent period of life. She lives and takes care of her alcoholic mother (Yernaut) with whom she has a very contentious relationship with. Rosetta gets by the best she can, sometimes by selling clothes and even catching her own fish for food. She can’t seem to hold onto a job long enough to get unemployment but is persistent, aggressively looking for work wherever she can. They are so poor that Rosetta’s mother services their landlord sexually in order to pay for their utilities. Afterwards, Rosetta doesn’t even yell or cry at her mother – just matter-of-factly takes the money and gets a receipt from the landlord. In her feature film debut, Emilie Dequenne delivers a performance free of actor-ly tics and self-consciousness. She fearlessly depicts Rosetta warts and all so that we are privy to several aspects of her life in a way that is sometimes uncomfortably honest. The actress was awarded for this startlingly brave debut with the Best Actress award at Cannes the year it was shown. The Dardenne brothers adopt a gritty, verite approach reminiscent of John Cassavetes, including an emphasis on close-ups of the actors’ faces. In doing so, they offer an intimate look into Rosetta’s life and the world she inhabits. The camera is always with her and so we quickly grow to empathize with the young woman. This kinetic, hand-held camerawork is usually reserved for action films like the Bourne franchise or found-footage horror films like The Blair Witch Project (1999), and so applying it to the kitchen sink drama is a breath of fresh air and only enhances the visceral nature of what we are watching. This raw approach also reflects the rough around the edges personality of Rosetta. Despite her sometimes prickly nature, she is easy to root for because in the face of such economic hardships she determinedly presses on. All Rosetta wants is a normal life like anyone else – is that too much to ask? Film critic Scott Foundas interviews filmmakers Jean-Pierre and Luc Dardenne about Rosetta. They were interested in examining the relationship between a young woman and her mother with an emphasis on the hardships she faces and how unique it is for someone her age to have so many disadvantages. They were interested in presenting a character with a single-minded obsession: to get a job. The Dardenne brothers come across as very intelligent and they obviously put a lot of thought into their film. Actors Emilie Dequenne and Olivier Gourmet are interviewed. She talks about getting the role, including how she heard about it and the auditioning process. Gourmet came in during pre-production and rehearsed with Dequenne. He talks about his approach to creating a character while she talks about how the clothes Rosetta wore informed how she moved and acted.